Commissions are always a challenge. In this case I was commissioned to make a set of eggnog cups. The brief was quite specific. There is always the worry of whether the finished piece or pieces will live up to expectations not just from me but from the person who has placed the commission. When the colours are specified, as they were here, there is the difficulty of knowing whether the glazes will do as expected in the firing. Glazing always has an element of unpredictability. Opening the kiln is like Christmas- sometimes you are over the moon and sometimes it is a disappointment. 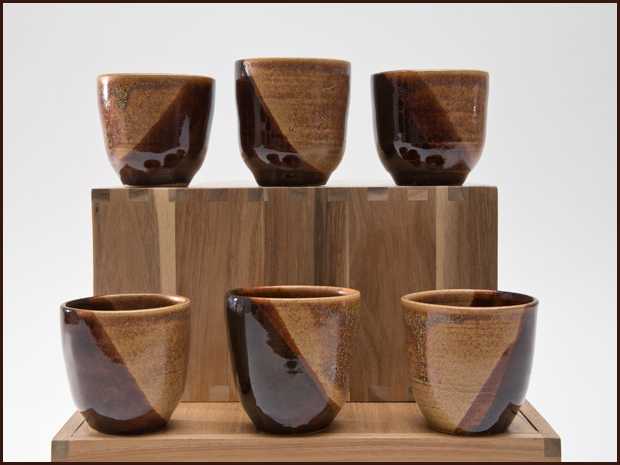 These cups were dipped twice to make a diagonal line with two different glazes. Fortunately, or I should say, as planned, the colours came out well. Eggnog for Christmas – delicious! This entry was posted in New work on January 10, 2016 by Carol.